Despite the many ways we may striving toward optimal health in our lives, face it, finding it isn’t easy these days. Each of us is challenged with more stress, environmental pollutants, electromagnetic field radiation and stimulus than ever before. We may eat well, exercise regularly, meditate, and do myriad of other healthful practice and yet still may feel like we’re not operating with a full tank of energy and good health. Biodynamic Craniosacral Therapy is a gentle, hands on modality of healing that focuses on the health that is inherent in each of us. This focus can help reorient our systems to that health and in so doing can help to release patterns of trauma and pain. 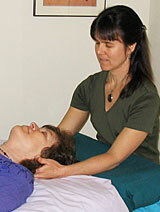 Though the work is subtle, it can be very powerful, bringing us to a deep state of relaxation and sense of well-being.